Following up his not so positive opinion of ABC's move to offer shows online for free, Todd Copelvitz (yes, you will be hearing a lot more from him) offers ABC five suggestions on how they could have, and still can, make the offering better and more inline with people's media consumption habits. For Copelvitz, as it is for us, it's about choice. Provide people choices. Todd says ABC should offer their programming in multiple formats. Not just ad-supported online of pay-per-download from iTunes but provide a full gamut of choices from pay to free, from TV to cell phone. Let the consumer choose to pay for ad-free TV or ad-supported TV. Let them choose the sponsors they want to hear from as Weatherbug does. Adding to that, make the commercial specific to the medium through which it is delivered. TV gets bog bold production. Cell phone gets smaller, more interactive version. In reaction to ABC's announcement it would provide advertiser-supported free programming online without the ability to skip ads, Todd Copelvitz suggested ABC check out these things called DVRs and Slingbox which allows a person to access their DVR from anywhere in the world...and skip the ads. Now, Todd has a guest writer who likens the industry's missteps 100 years ago with the advent of radio to current missteps by broadcaster faced with the possibilities the Internet provides. The writer wonder about ABC's mindset here writing, "...does anyone really believe that if you force me to sit through a commercial while watching one of these shows online that I'll really pay attention to it? Nope, I'll be checking my email, having an IM conversation and paying my bills online. Because that's how I use my broadband connection and any advertiser trying to get my attention has to understand that." It seems everyone's over the whole Kate Moss cocaine addiction thing. After all, it's not surprising given how fickle we are as an industry and how we love our celebs. Kate Moss, hot off returning to Calvin Klein, has signed with Nikon to help promote the company's new Coolpix S6 camera line. Moss will appear in print, TV and cinema ads as well as a promotional website which teases visitors to come back May 8 when "all will be revealed" even though the promotional site progresses to the Nikon site that tells you about the camera. MWW worked on the project concept. McCann-Erikson created the spots. Life Might Take Visa But 'America Runs On Dunkin'"
Sounding oddly similar to Visa's new tagline "Life Takes Visa," Hill Holliday has just introduced a new tagline for Dunkin' Donuts: "America Runs On Dunkin'" Hmm. Well, we're not complaining. After all, there's isn't much more you need to get through life than a credit card and caffeine. There are eight spots in the campaign, most of which play like music videos and do the whole coffee as lifestyle thing. Our favorite, Pleather, rocks on about that annoying summer problem of legs sticking to leather/pleather car seats. The campaign also includes nine radio spots, print, in-store advertising, outdoor and online. UPDATE: Hill Holliday lays out all the work and the thinking behind it on their new website/blog. 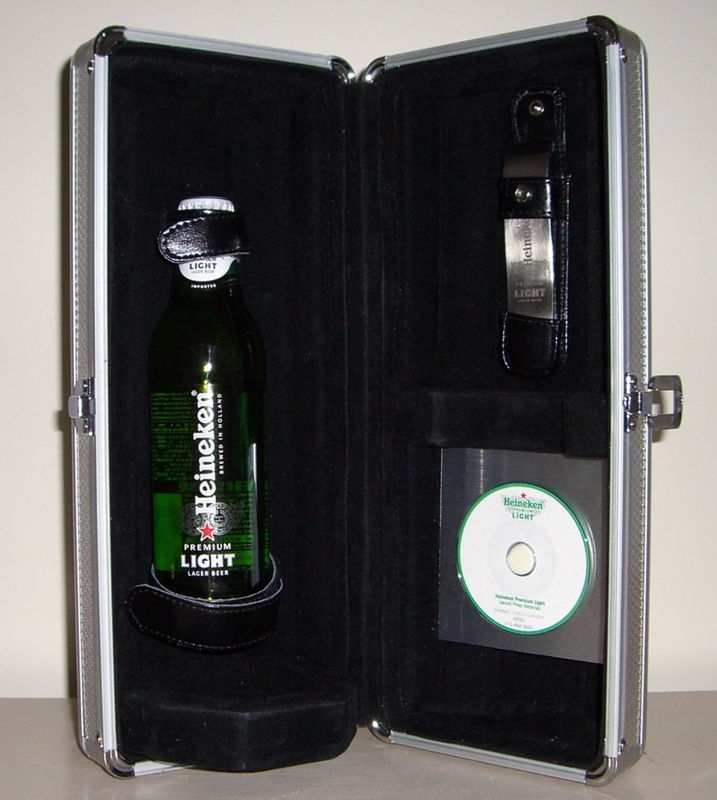 The other day, we received our very own, specially packaged bottle of Heineken Premium Light. We promptly did our job by taking a few pictures of the packaging to share with you and then placed the bottle in the fridge for future enjoyment. Well, that future came and we can tell you we liked what came out of that bottle. In terms of promotion, Heineken Premium Light is getting $50 million thrown at it in the form of a national marketing campaign with simple layouts of a Heineken Premium Light bottle and taglines such as "Succumb to Smooth." There's also an out-of-home component to support the wider distribution of the beer and national television advertising kicks off on April 17. OK, that's it for all you teen-loving 30/40-something men. With the launch of a new stalker awareness campaign, News Corp. hopes to make MySpace teens completely aware of your shenanigans and boot you back to women your own age. Created by the Ad Council in 2005, the campaign will blanket Fox properties MySpace, Fox network, FX, National Geographic and Fuel TV. With the ever-imaginative tagline, "Don't believe the type," the ads point people to the National Center for Missing and Exploited Children's center website which then links to a page specific to the campaign. On that page are links to the PSAa, a game that aims to teach kids about the sketchiness on online profiles and an area with information for parents. Dallas Mavericks owner Mark Cuban says the future of television advertising is in its past. He says bring back the live commercial so the viewer (nor the advertiser) will know what to expect until it happens. Calling them Reality Commercials, Cuban claims implementing such a thing would not be a technical challeng or a creatyive one but it would entail a whole lot more work. He cites a couple of examples which does get the mind thinking. After all, a commercial riffing unexpectedly off what the viewer just watched would be far more interesting and integrated than a canned spot. And, oh, the potential for screw ups....that alone would keep a fair amount of people watching. Wieden + Kennedy's 12, the program that gives people the chance to break into advertising, have created a promotional spot for Wordstock, a Portland area book festival. We like it. On this week's episode of The Apprentice, Donald Trump, with his usual "listen to me speak because I don't give a sit what you say" style, fired home builder Bryce, pretty much the most level-headed, well-grounded apprentice in the bunch. His team lost a challenge in which they had to develop a jingle for Arby's new like or natural chicken sandwiches. While we're not so sure why that's such a differentiating factor since we've never met an unnatural chicken - except perhaps in a bucket of fried KFC, the Arby's execs wanted to drive home the point their chain is the only place to get natural chicken. I wonder if they's ever heard on Boston Market or any other restaurant that serves chicken. Now, if they mean organic, hormone-free chicken that isn't slammed against a wall to kill it like PETA so loves to show us in its videos, that might be something to hang the "only" strategy on.